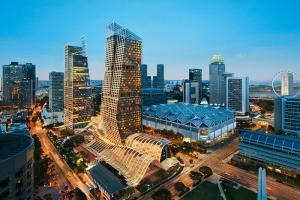 Located near Suntec city, JW Marriott hotel Singapore is where redefined luxury awaits. Elegantly appointed guest rooms and suites artfully blend historic heritage and contemporary style with luxurious amenities and sleek marble bathrooms. Restore balance to your mind and body with a massage, facial or beauty treatment at the signature spa. Treat yourself at one of the distinctive restaurants and get social at the chic bars. Unwind at the Sky Garden, which features a swimming pool and sweeping views of Singapore's skyline. Akira Restaurant; Beach Road Kitchen, Court Martial bar, Tonic, Cool Cats, Stags’ Room, Fish Pool and Madame Fan. The Media Bar is available for private events.